We study the inefficiency of equilibrium outcomes in bottleneck congestion games. These games model situations in which strategic players compete for a limited number of facilities. Each player allocates his weight to a (feasible) subset of the facilities with the goal to minimize the maximum (weight-dependent) latency that he experiences on any of these facilities. We derive upper and (asymptotically) matching lower bounds on the (strong) price of anarchy of linear bottleneck congestion games for a natural load balancing social cost objective (i.e., minimize the maximum latency of a facility). We restrict our studies to linear latency functions. 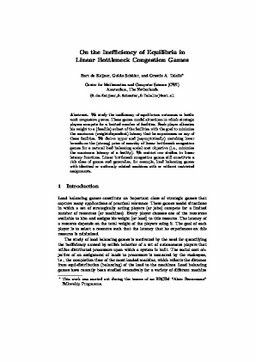 Linear bottleneck congestion games still constitute a rich class of games and generalize, for example, load balancing games with identical or uniformly related machines with or without restricted assignments.